Cup Characteristics: Light cherry chocolate aroma. Extremely smooth and very cleanly processed, not overbearing as can sometimes happen with natural processing. Chocolate cherry cordial flavors with some tropical fruit, notably guava both in flavor and texture. Low acidity with a long, unctuous finish. This Willoughby's Serious Select coffee will be roasted and shipped on Tuesdays 6/12 and 6/19. We have purchased coffee from Rusty's a number of times over the past several years and this year they called us offering a very small amount of a natural processed coffee they prepared with us in mind. I've had a chance to visit the folks at Rusty's, Lori (Rusty's widow), their daughter Joan and her husband Ralph, at their home in Ka'u and we have all become friends. Last month Ralph wrote and asked me if we had interest in a single bag, 100 pounds, of this Typica Natural coffee they had produced and processed. Like any coffee we are offered a sample was sent, roasted, cupped and subsequently purchased. It is the only coffee that we will see from them this year and we were quite pleased with its character. 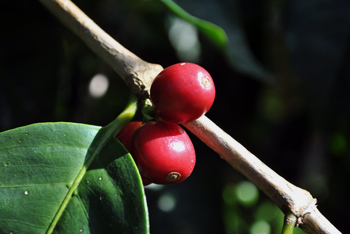 Typica is coffee's original varietal, its base DNA if you will. It was first discovered in the wild in the Great Rift Valley of Ethiopia, later cultivated in Yemen and has since spread to many places in the world. Many of the trees in Hawaii are Typica derived from seeds that originated in Guatemala. Processing: Natural, dry processed. Cherry is fully dried with skin intact. Drying: Mainly sun but finished in mechanical low temp dryer. A couple of years ago we visited the Big Island of Hawaii and after taking a wonderful drive south from the Kona coffee belt we passed through a variety of micro climates and dramatic views of the lava rich landscape which poured down to the ocean. We finally came to the Ka'u area in the southernmost part of the island, a couple hours from Kona. Rusty's 'farm' is owned by Lori Obra, daughter Joan and her husband Ralph (pictured above with Barry from Willoughby's). 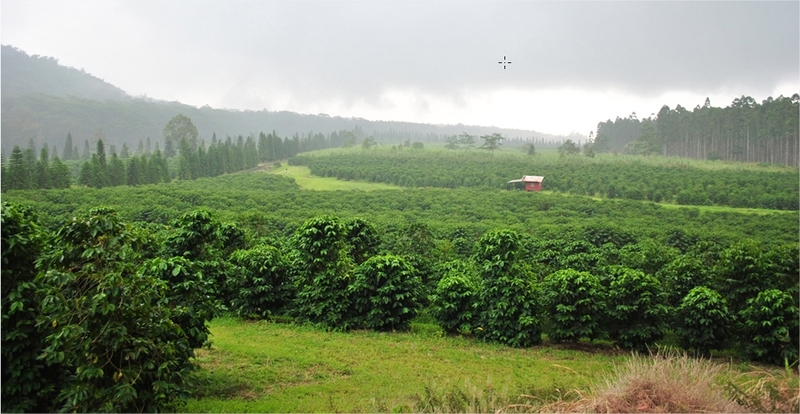 Ralph took us to their plot of growing land, formerly a sugar plantation that has been converted to coffee. Processing is done back at the house where Lori has a Penagos micromill in her backyard and drying tables in the front yard. Rusty's Hawaiian Coffee has attracted a lot of attention from coffee cogniscenti. They have taken Hawaiian grown and processed coffee to a whole new level. They are a company with extreme quality standards and they are also very experimental, pushing the envelope with processing techniques and varietals uncommon to the region. The experimentation, combined with a pursuit of excellence, has provided them with several significant awards as well as very high scores in reviews. We have offered other coffee from Rusty's these past years including a Red Caturra Natural which earned us a 94 point rating in Coffee Review, one of the highest of the year.